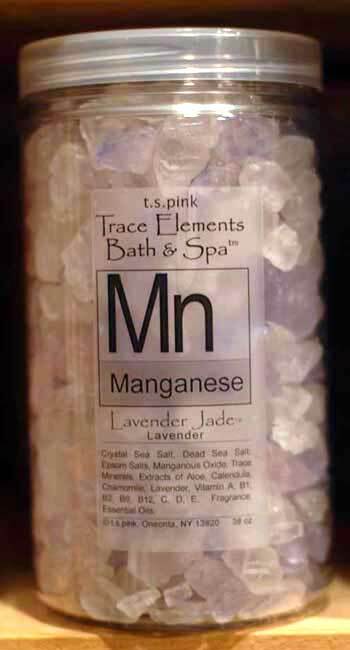 Manganese Bath & Spa Salts...enjoy the pleasures of bathing! Manganese, Lavender Jade bath & spa salts eliminate stress, moisturize the skin & gives your muscles a well deserved break. Manganese luxurious bath salts....an oasis of calm & relaxation! Wake up feeling energized & refreshed. Manganese Bath & Spa Salts / Crystals contain Crystal Sea Salts, Dead Sea Salts, Epsom Salts, Manganous Oxide, Trace Minerals, Extracts of Aloe, Calendula, Chamomile, Lavender, Vitamins A, B1, B12, C, D, & E. Fragrance & Essential Oils. T. S. Pink Manganese Bath & Spa Salts / Crystals.